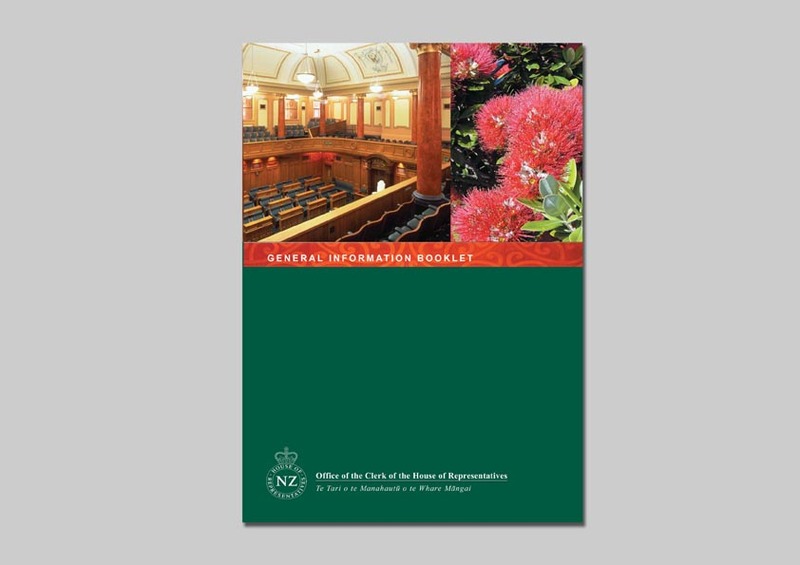 The New Zealand House of Representatives is a component of the New Zealand Parliament, along with the Sovereign The House passes all laws, provides ministers to form a Cabinet, and supervises the work of the Government. It is also responsible for adopting the state’s budgets and approving the state’s accounts. Format: 56 page A4 Saddle Stitched. Brief: The client required a professional clean-cut design. It needed to be people focused, portraying the staff and the daily workings of the Office of the House of Representatives. Solution: The layout was simple with professional photos. 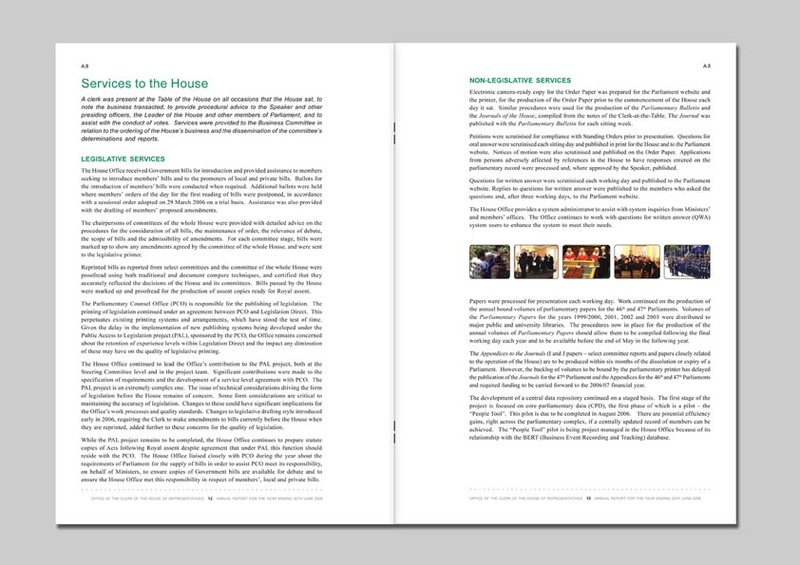 The stock for the cover was a heavy laid card with a texture printed int the corporate dark green. 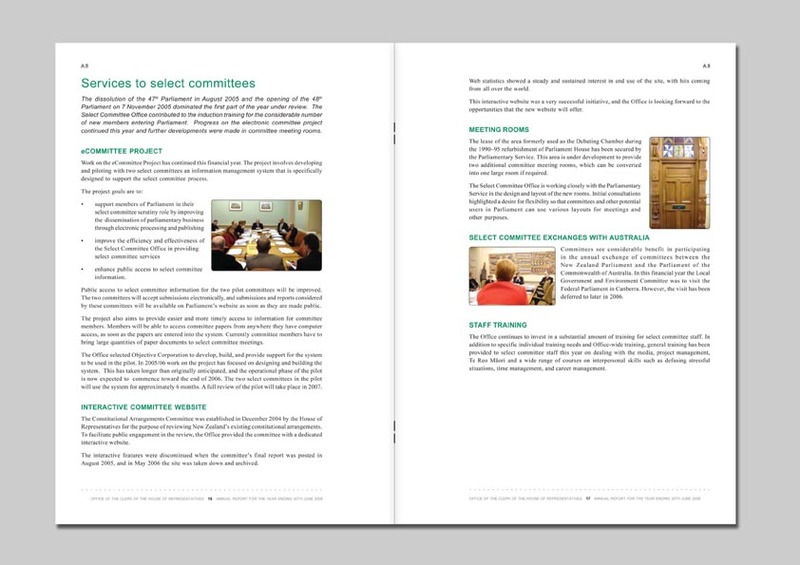 The printing of the Annual Report involved a few processes. 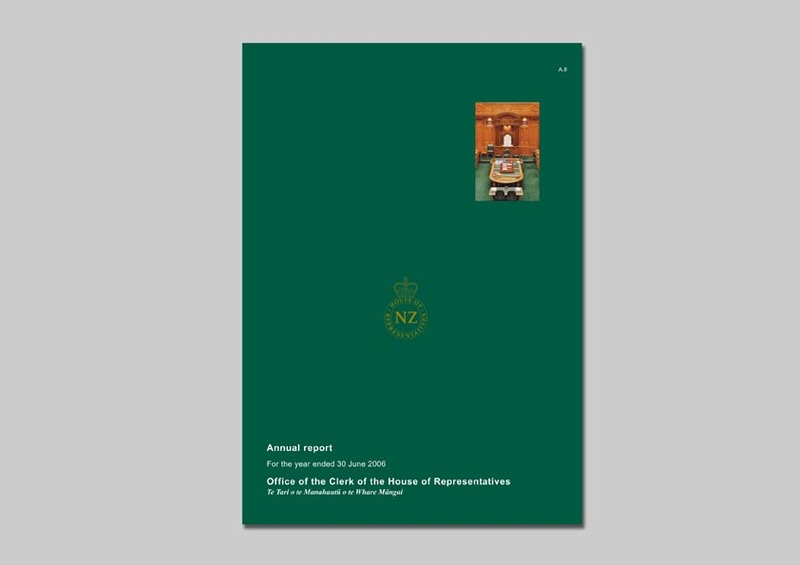 The photo and the NZ House of Representatives logo on the cover were both embossed, the logo was then printed on top with gold foil. 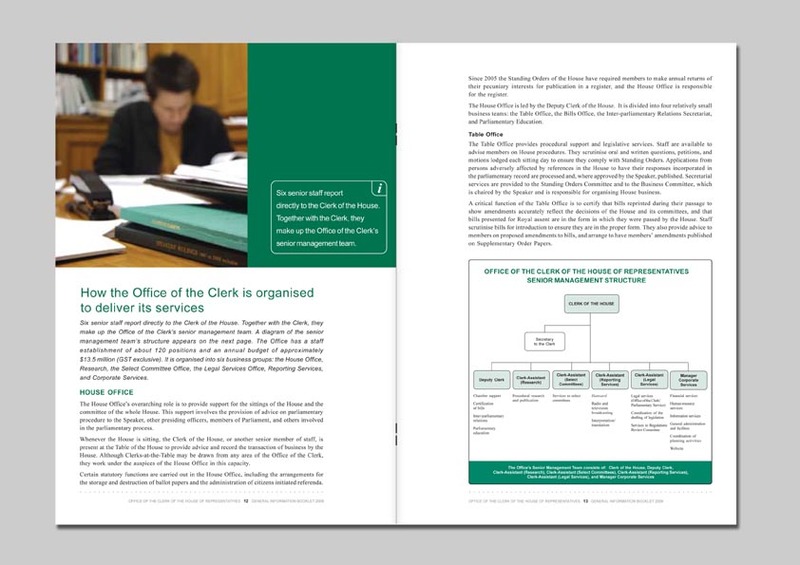 I designed and laid out the Annual Report for The Office of the Clerk of the House of Representatives for six consecutive years. 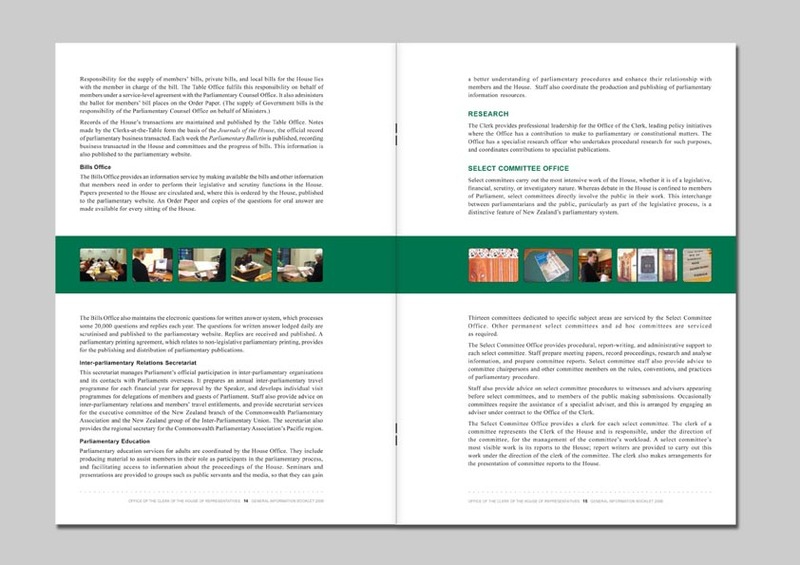 Brief: The client required the look of the design to be professional and clean-cut. It needed to be people focused, portraying the staff and the daily workings of the Office of the House of Representatives. Solution: The layout was simple but at the same time classically stylish, I used professional photos that were supplied by the client. The stock for the cover was a heavy laid card with a texture, the same stock used for the Annual Report cover.